Discover the ultimate luxury island getaway at the Great Barrier Reef’s best island resort. With a commitment to sustainability, each room embraces the natural environment. Our boutique, all-inclusive accommodation offers 14 contemporary suites, all facing immaculate beachfront. At Orpheus, luxury has never been so comfortable. 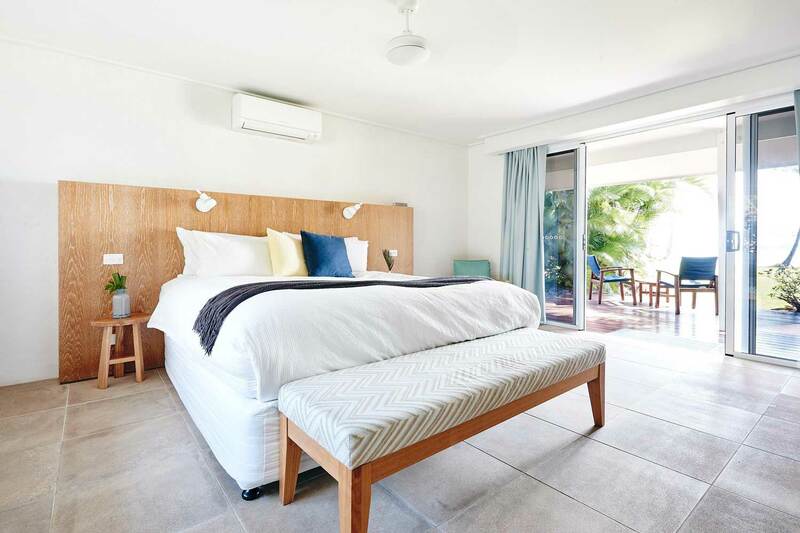 With sweeping views of the Coral Sea, the North Beachfront room is our stunning entry level accommodation. Perfect for couples or people travelling as a twosome, these rooms are the epitome of laid-back luxury and can be booked with one king bed or twin beds. With a spectacular view out to the Coral Sea the North Beachfront Suites are perfectly sheltered ensuring a tranquil sanctuary for you to unwind in. These suites are perfect for couples or those with an additional guest and can easily accommodate an extra bed. $2,000 per night, for two guests. Maximum of three guests. Situated on the sheltered western side of the island, there are four Villas on Orpheus. This tranquil north wing accommodation offers contemporary and minimalist island aesthetics, with plenty of room to relax and unwind after exploring the island. Perfect for families or groups, boasting Coral Sea views, spectacular Orpheus sunsets and a fresh sea breeze. $3,000 per night, for four guests. Maximum of five guests. Offering utter privacy, just a stone's throw from the water's edge and surrounded by lush tropical gardens. These bungalow-style rooms are understated whilst embracing the natural surrounds. Smaller than the suites, they feature private indoor and outdoor showers. Unobtrusive, romantic and contemporary, these stylish suites offer a secluded escape, wake up amongst rich tropical gardens with a view out to the ocean. These spacious suites are perfect for couples or honeymooners. $2,300 per night, for two guests. Maximum of three guests.